I had grand plans to share about a thousand and one more cookie recipes before Christmas this year, but somehow life got in the way. So even though this is slightly more indulgent than cookies, there’s definitely still a cookie influence I just couldn’t get out of there. So snickerdoodle slices it is! I said “cheesecake” above by the way, but the only semblance to a cheesecake is the texture. The flavor is more ice-cream like in these little slices of goodness. 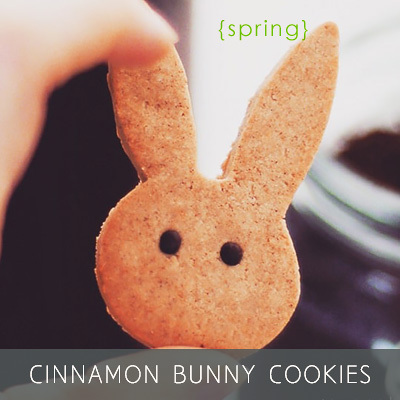 With a cinnamon “sugar” twist. Really simple, “familiar”, and cozy. Speaking of cookies, and snickerdoodles, and cinnamon — I used to make these killer snickerdoodle cookies some years back. 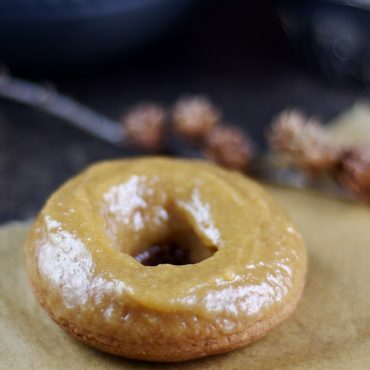 They were made with vegan cream cheese, but loaded with tons of sugar… and I don’t know where the recipe is anymore, but I’m suddenly getting a hankering to give those a makeover… Will have to rummage my old notes and track those down.. These snickerdoodle slices are another mini-dessert, that can of course be scaled up to be a large cake or to accommodate a larger number of people, but I kept it tiny, because, well… there’s quite an abundance of dessert around this time of year, and I’d like to have my cake and eat it too — actually, as many different types of cake as possible, please — even if in smaller servings. And with a side of this eggnog too ? 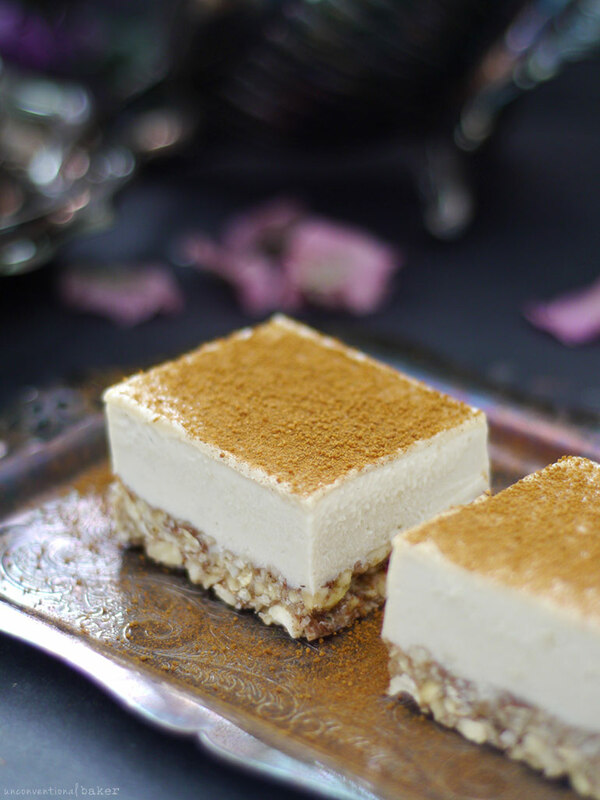 Raw vegan cheesecake meets snickerdoodle cookie in a creamy, billowy layered dessert slice. 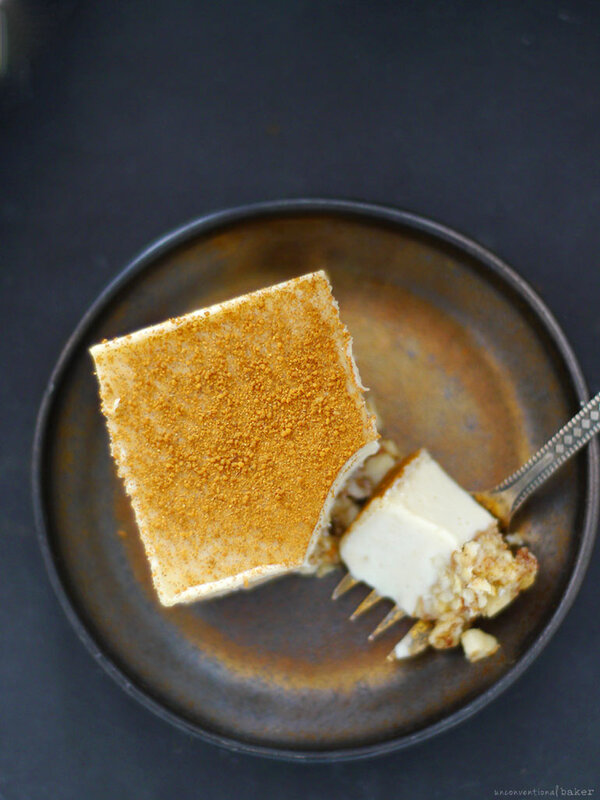 Gluten-free and indulgent, with cinnamon sugar ice cream flavoring. Make sure all filling ingredients are at room temp. Blend everything in a high power blender into a smooth uniform consistency. Transfer the mixture into the prepared crust. 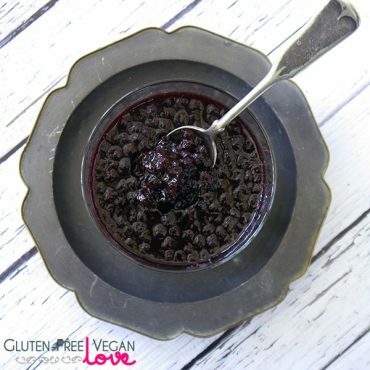 Mix the topping ingredients together in a small bowl. Gently sprinkle over the prepared filling. Freeze for 5-6 hours or overnight. 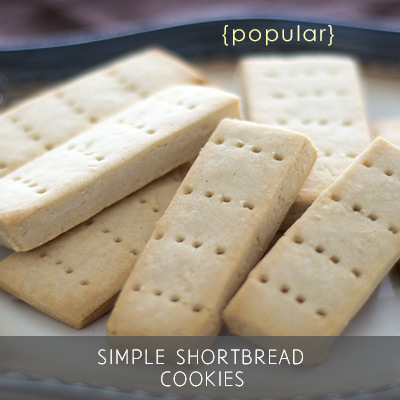 Remove from container, trim off the edges (if desired), slice and enjoy! Keep leftovers frozen. Your site is very inspirational with all these amazing pictures and recipes! I just found your site and I LOVE it! 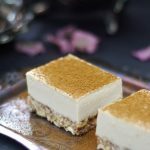 I made the Raw Snickerdoodle Slice and LOVED IT! 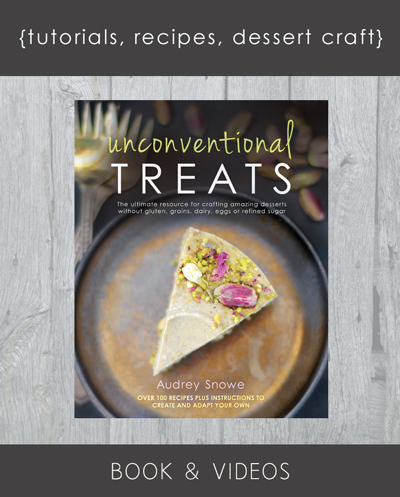 Gluten free, dairy free, egg free! Thank you! Hi Linda, you’re most welcome :) So happy you enjoyed it! Oh my goodness, Audrey! 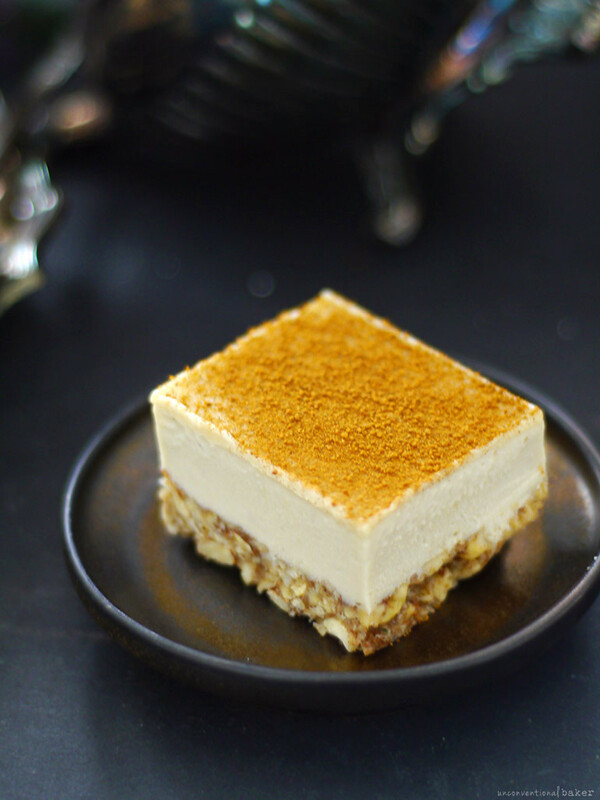 I prepared this little beauty for dessert tonight and we loved it! Hey Dee — so happy you enjoyed it :) Thank you for the lovely feedback! Simply beautiful, simple and seems delicious. I’m not sure how old your comment is AlyssaBug …. since there are no dates on the comments or recipes, but I hope you get to see this ☺. May I know the size of the cake pan you used after tripling the recipe? 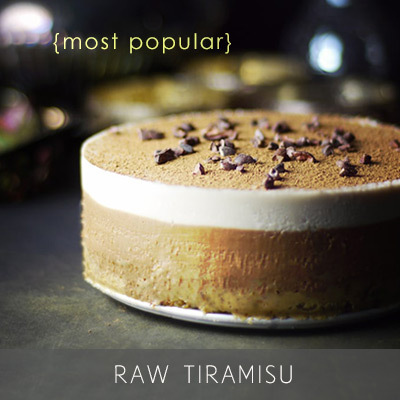 To date I’ve made the vanilla cashew ice cream, beetroot nice cream (have made nice creams many times but never thought of including vegs in them so this was something new and surprisingly good), and the raw carrot cupcakes and I’ve only barely discovered this site a week ago! This is on my next to make list. Hi Jason. Sorry, I don’t count nutritional specs for my recipes. But you can use a free online calculator, like this one, to calculate them yourself. OMG! This sounds simply divine! Oh my goodness. MUST MAKE THIS! Thanks, Kara! :) And I agree ? Hehe. 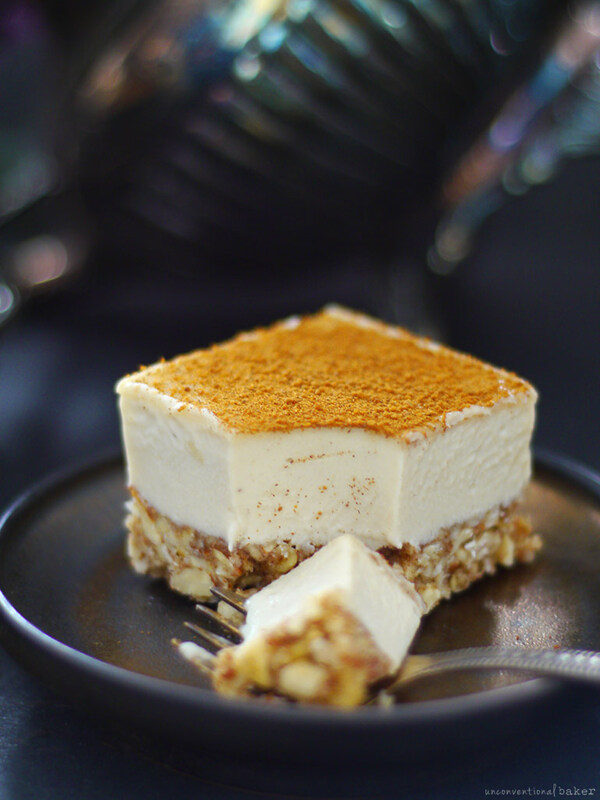 Yes, the creaminess + cinnamon did it for me :) ? So funny, I do think your blog and cinnamon go hand in hand somehow.